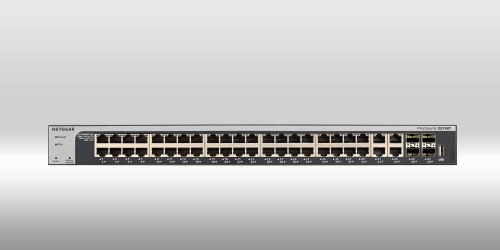 The NETGEAR ProSAFE® XS708T, XS716T, XS728T, and XS748T are powerful Smart Managed Switches that come with 8, 16, 24, or 44 10-Gigabit Copper ports and either 2 Shared (Combo) Copper/SFP+ ports (XS708T/XS716T) or 4 additional Dedicated SFP+ ports (XS728T/XS748T) for 10G Fiber links. The NETGEAR 10-Gigabit Smart Managed Switches are purposely designed as a cost-effective way to provide 10G connections to 10G-capable servers and NAS (Network Attached Storage) systems. They can be used at the “center of a small business network” or as an aggregation / access switch in a larger organization including workgroup access, connecting to a 10‑Gigabit NETGEAR ProSAFE Fully Managed Switch on one end and extending the 10G connections to the edge. The XS708T and XS716T are also ideal for smaller workgroups that need high bandwidth for sharing, collaborating, editing, and publishing high-density content like video or animation.